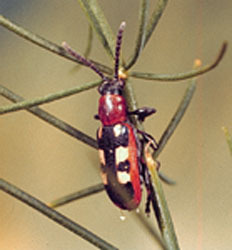 There are two species of asparagus beetles: common and spotted. All life stages feed upon asparagus plants, and organic controls include good fall cleanup, attracting beneficial insects, letting poultry out (if you have them), and spraying adult plants with neem oil. The growing asparagus plant is susceptible at all stages of growth to attack by different stages of beetles: adults, larva and eggs. 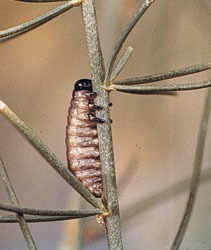 Adults feed on both newly emerged asparagus shoots, as well as the stems and leaves of the adult plant. Larva feed on the red berries. The very best way to control beetles is to set your chickens or ducks out into the bed to gobble them up like candy. Unfortunately, for those of us without duck or chicken helpers, organic control of beetles is difficult - but not impossible. It is important to remove and destroy (or dumpster) all the died-down crop waste from asparagus tops, because the adults will overwinter in the debris. Handpick adult beetles and larva off plants. This is tedious, but does actually work. Squish them if you're not squeamish, or drop them in a coffee can with some molasses in the bottom. Harvest young short spears early. Harvesting the spears when they are only 4-7" high often gets them before the eggs can hatch and begin sharing the harvest. Wash freshly picked spears and cook right away. 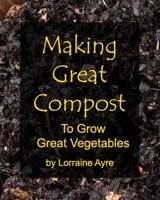 Harvest by cutting spears off at soil level. Spray adult plants with neem oil. Neem oil is effective against asparagus beetles, but it's not an overnight cure. It disorients the beetles and disrupts their feeding and reproductive cycles. Safer brand insecticidal spray may also be effective. Spray the adult plants later in the summer, but do not use on young fresh spears you are about to harvest and eat. Plant a flower insectary for beneficial insects. 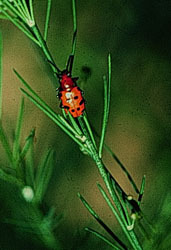 Asparagus beetles are also preyed upon by parasitic wasps and ladybugs, so making a good habitat for beneficial insects is another helpful tactic. Plant dill, fennel, cilantro and other small-petaled flowers to attract beneficials, and provide them with a watering saucer filled with stones to keep them around. Pay attention to your plants after the harvest is over and the plants are ferned-out, because beetles stress adult plants, overwinter in debris, and will decrease or damage next spring’s harvest. Keep them in check using the control measures above.